I read the interview anthology The New New Journalism a couple of years ago, and one of the many things that struck me while reading it was how consistently the writers interviewed for the book said they didn’t use an “outline” when organizing the mass of material to write long-form narrative nonfiction. Just as consistently, immediately after that declaration, the writer would describe how they DID organize the material—which was frequently a list of topics, high points in the material, turning points in their pursuit of the story—and their approach would basically be an outline in everything but name. So outlines are rarely the tool of choice when organizing material, but there are alternatives to a) making a list (and obsessing over it way more than twice) or b) just plunging into writing without structuring the material, which is a little like trying to do a do-it-yourself home improvement project without measuring anything. I’ve found 3 structuring techniques that go beyond the humble list method, give your writing a visual boost, and can even prepare your finished piece for a world beyond print. Popularized by Tony Buzan, mind-mapping has spawned a cottage industry of software that will take your thoughts and provide a visual display of relationships between ideas and where the linkages are. It’s sort of like a 3-D list. 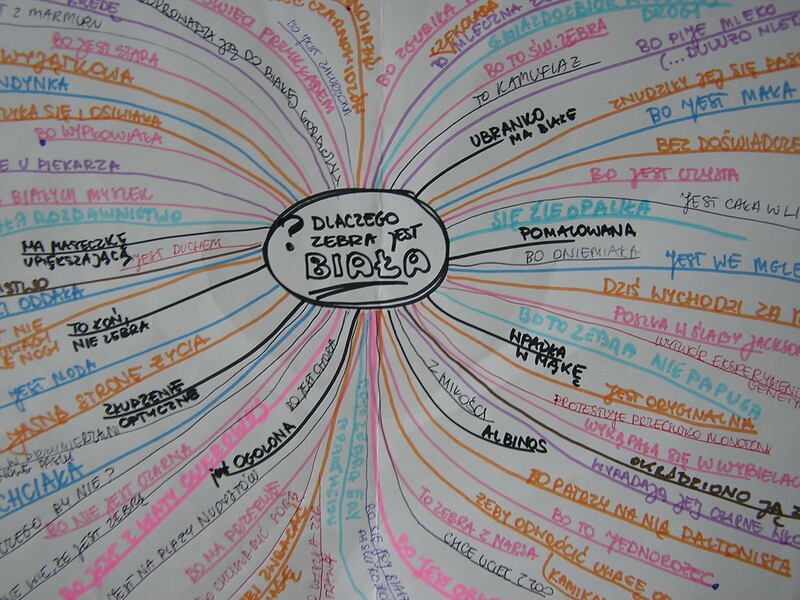 Mind mapping in action (image courtesy SXC). Here’s a link on Tony’s site to a mind-map of a concept from a book by Edward De Bono, Six Thinking Hats. And here’s a very interesting Flash-based instructional mind-map on how to use mind maps to write an essay. A related type of mapping is Idea Mapping, based on a book of the same name by Jamie Nast. Her blog has great examples of conceptual maps from a variety of contexts, including maps of books. The greatest advantage of mind-mapping a nonfiction story is that it makes the whole process less linear, and helps you see multiple relationships between topics and sub-topics in your story. As an editor, I often mind-map as I brainstorm story assignments for my writers; as a writer, it’s been an interesting way to supplement the “list method” of organizing my stories. As one might expect, fiction writers have discovered how useful storyboarding is to their writing. For nonfiction writers, storyboards can help keep a large “cast of characters” organized, reveal gaps in information, uncover points where lesser storylines threaten to derail the main thrust of your article or book, and provide an easy at-a-glance reference for a long manuscript. This newsletter article from a romance writers group discusses several ways to create a storyboard for a written piece. Lightning Bug’s article on storyboarding is also good, especially because it demonstrates how simple the pictures can be and still be effective. Frankly, spending time creating beautiful graphics isn’t the point—if you can understand what you sketched later, that’s enough! One last tool that can help you see patterns in your research is the concept of the tag cloud, which provides a visual representation of the frequency of words or topics in a given piece of writing. Popularized by blogs, tag clouds can be an aid to a user’s search of a site—if a tag that matches their search is big enough, they may be enticed deeper into an online site. For those of you unfamiliar with tag clouds, here’s one from my delicious.com feed. 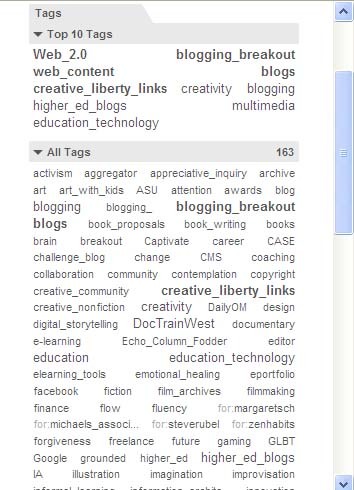 A tag cloud on the social bookmarking site Delicious. Wordle is another interesting tool for finding patterns or repeating elements in your writing. It creates word clouds that look and function much the same as tag clouds. Here’s an image via Wordle that was created from a newsletter article I wrote a while back about persistence and creativity. My suggestion for using Wordle to structure your story is to do a free-form brain dump on your material, up to 500 words long, then drop the piece into Wordle and see what patterns emerge. The post takes you through the initial brainstorm and moves to clustering story elements, developing a character etc.